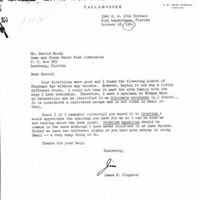 A letter of correspondence between Harold L. Moody and James "Jim" P. Clugston, both fishery biologists working for the Florida Game and Freshwater Fish Commission (merged into the Florida Fish and Wildlife Conservation Commission in 1999). The letter discusses the identification of a plant specimen found near Lake Apopka by Harold L. Moody and identified by Erdman West as Taro, Colocasia esculenta. Taro is native to Africa and considered an invasive species in Florida. Taro was introduced to the Americas as a food crop for slaves. 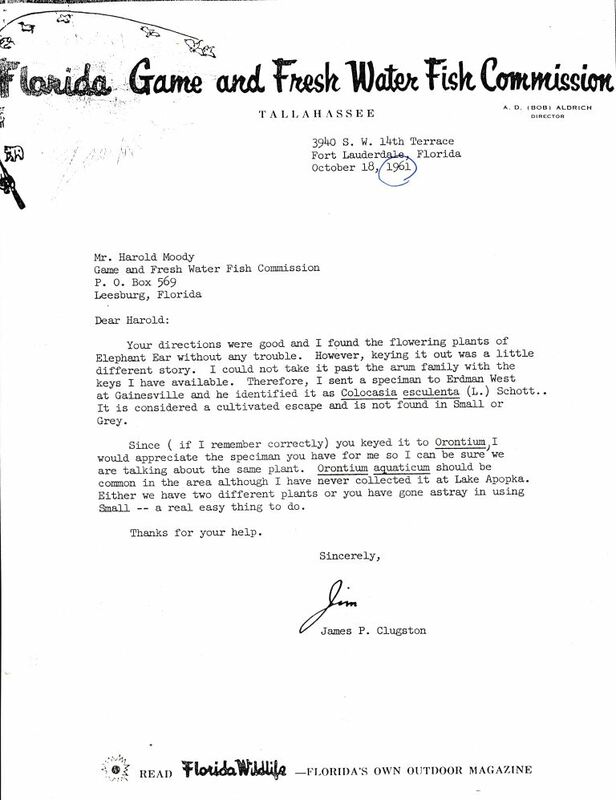 This letter may serve as evidence of the introduction of this plant to Central Florida by 1967. Photocopy of original 1-page typewritten letter from James "Jim" P. Clugston to Harold L. Moody, October 18,1961: binder 1961, drawer 1938-1987, Friends of Lake Apopka Archives, Ginn Museum, Oakland Nature Preserve, Oakland, Florida. Digital reproduction of photocopied 1-page typewritten letter from James "Jim" P. Clugston to Harold L. Moody, October 10, 1961. Binder 1961, drawer 1938-1987, Friends of Lake Apopka Archives, Ginn Museum, Oakland Nature Preserve, Oakland, Florida. Oakland Nature Preserve Collection, RICHES of Central Florida. Originally created by James "Jim" P. Clugston. "Learn About Your Watershed: Ocklawaha River Watershed." Florida's Water: Ours to Protect, Florida Department of Environmental Protection. Accessed June 12, 2015. http://www.protectingourwater.org/watersheds/map/ocklawaha/. "Wild Taro, Dasheen | Center for Aquatic and Invasive Plants." Wild Taro, Dasheen | Center for Aquatic and Invasive Plants. Accessed June 8, 2015. http://plants.ifas.ufl.edu/node/108. "About the FWC." Florida Fish and Wildlife Conservation Commission. Accessed June 12, 2015. http://myfwc.com/about/. Your directions were good and I found the flowering plants of Elephant Ear without any trouble. However, keying it out was a little different story. I could not take it past the arum family with the keys I have available. Therefore, I sent a speciman[sic] to Erdman West at Gainesville and he identified it as Colocasia esculenta (L.) Schott.. It is considered a cultivated escape and is not found in Small or Gret. Since (if I remember correctly) you keyed it to Orontium, I would appreciate the speciman[sic] you have for me so I can be sure we are talking about the same plant. Orontium aquaticum should be common in the area although I have never collected it at Lake Apopka. Either we have two different plants or you have gone astray using Small -- a real easy thing to do. Clugston, James P.. “Letter from James "Jim" P. Clugston to Harold L. Moody (October 18,1961).” RICHES of Central Florida accessed April 25, 2019, https://richesmi.cah.ucf.edu/omeka/items/show/5217.